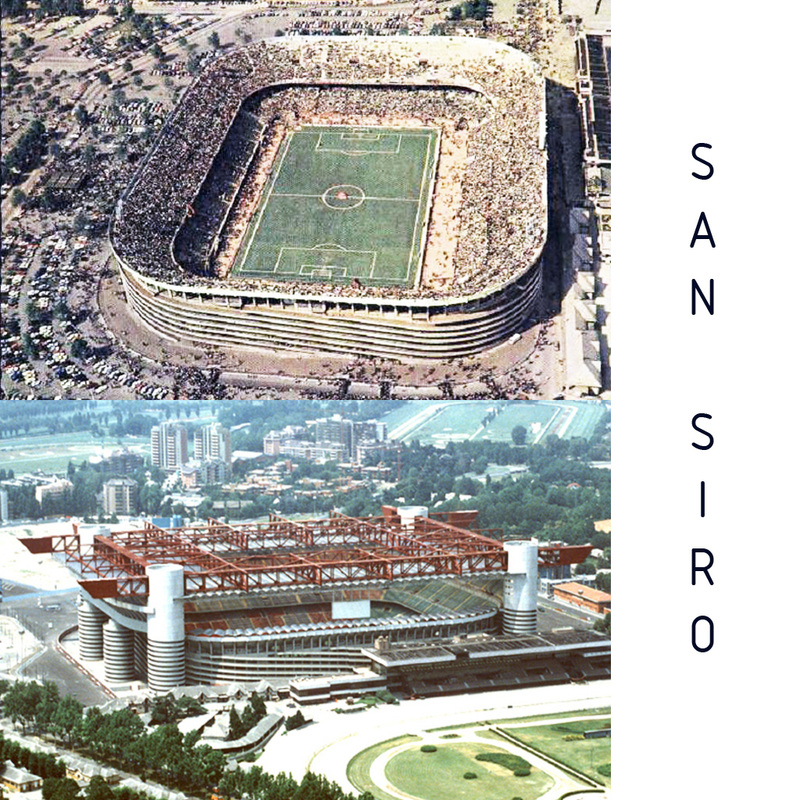 Italian modern football (soccer) infrastructure has practically been built and renovated around the World Cup of 1990 and some stadiums even date back to the World Cup of 1934. During the Italian fascist years (1922-1943) many of the football stadiums, which are still in use in its original or renovated form, were built. Such are the examples of the Stadio Atleti Azzurri d’Italia in Bergamo, the Olympic Stadium of Rome, the Olympic Stadium of Turin, and the Stadio Artemio Franchi in Florence. Italy has hosted world class sports events such as the Summer Olympics of 1960, the Winter Olympics of 2006, the European Football Championships of 1968 and 1980 and the already mentioned Football World Cups of 1934 and 1990. The stadiums currently used for the Serie A championship, Italian top football division, have played important roles in these events. 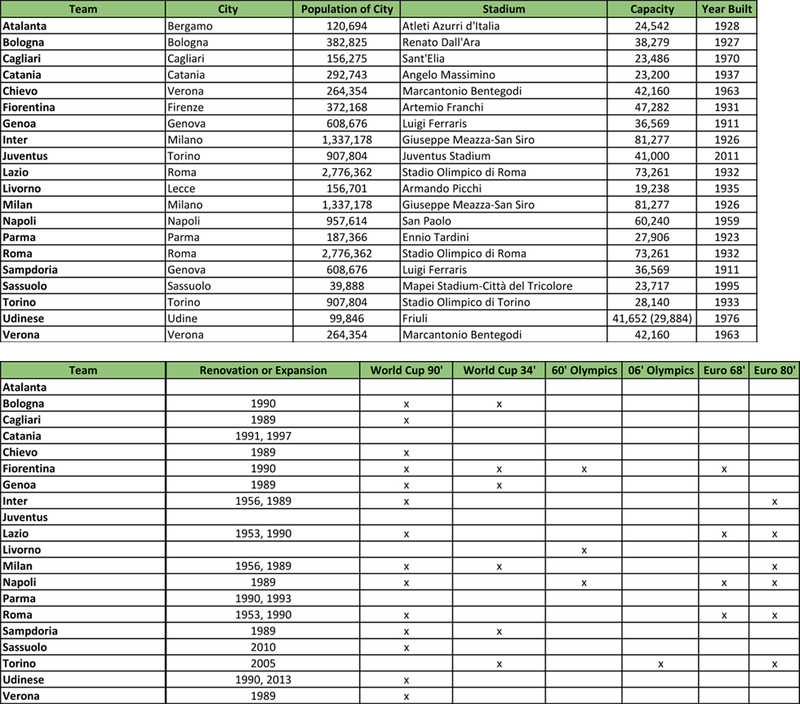 We have compiled information to produce a table in which we analyze the infrastructure of all the current football teams playing in the top division. As a result, we can clearly see that most of the stadiums in use today have a direct relationship to one of the major athletic events. 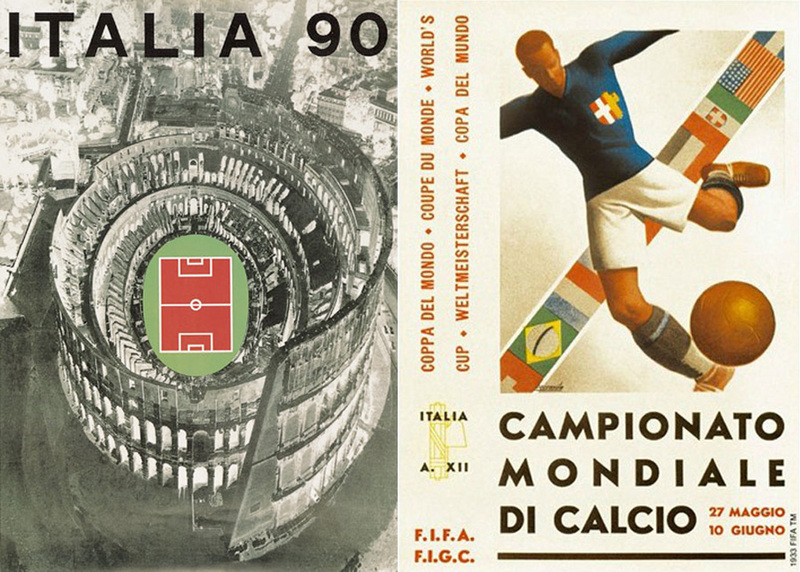 The World Cup of 1990 has defined the modern infrastructure of Italian football. Juventus F.C has been the only team which has built a stadium after the 1990 World Cup. The Juventus Stadium was opened in 2011 with a capacity of 41,000 seats. Previously, Juventus F.C. played at the Stadio Delle Alpi, which was built for the 1990 World Cup with a capacity of 69,041 seats. Bari: Stadio San Nicola. Designed by architect Renzo Piano. Firenze: Stadio Artemio Franchi (Stadio Comunale). 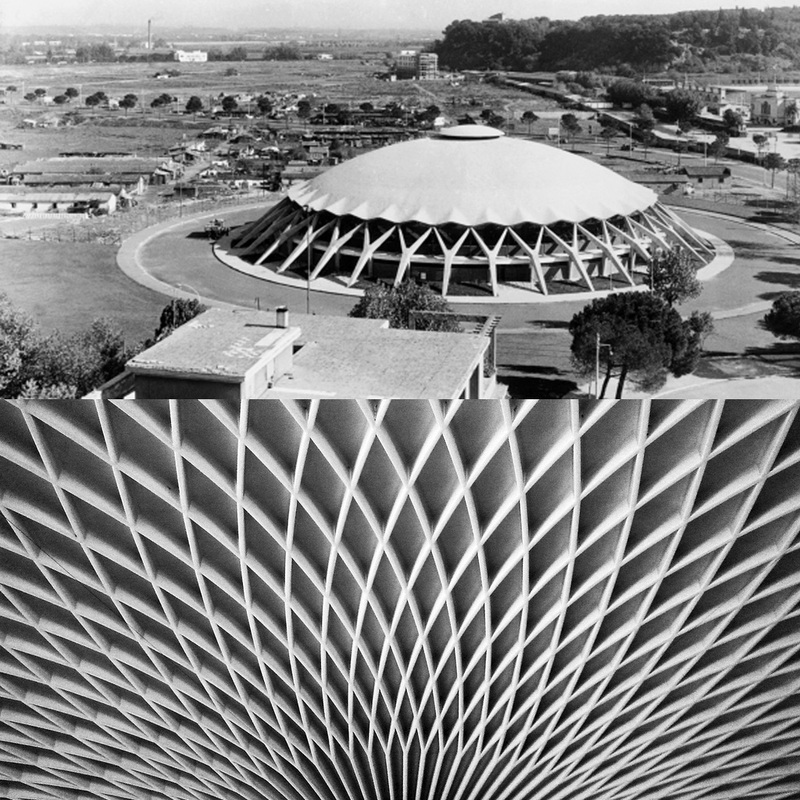 Designed by Pier Luigi Nervi. Roma: Stadio San Paolo. Designed by Carlo Cocchia. Udine: Stadio Friuli. Designed by Lorenzo Giacomuzzi Moore. A.S. Roma, has announced in 2012 that they are planning to build a new stadium for their team. In 2011 A.S. Roma was bought by an American group of Investors lead by Thomas R. DiBendetto. Their new stadium is planned to be built by 2016 with a capacity of 60,000 spectators. While Udinese Calcio is currently undergoing a major renovation of their Stadio Friuli. The decision was made after Italy was not chosen to organize the European Football Championships of 2012 and 2016, which included a renovation of Stadio Friuli. The athletic infrastructure of Rome also benefited from the 1960 Olympics. Besides the Olympic Stadium, other structures, which are still in use, were built. 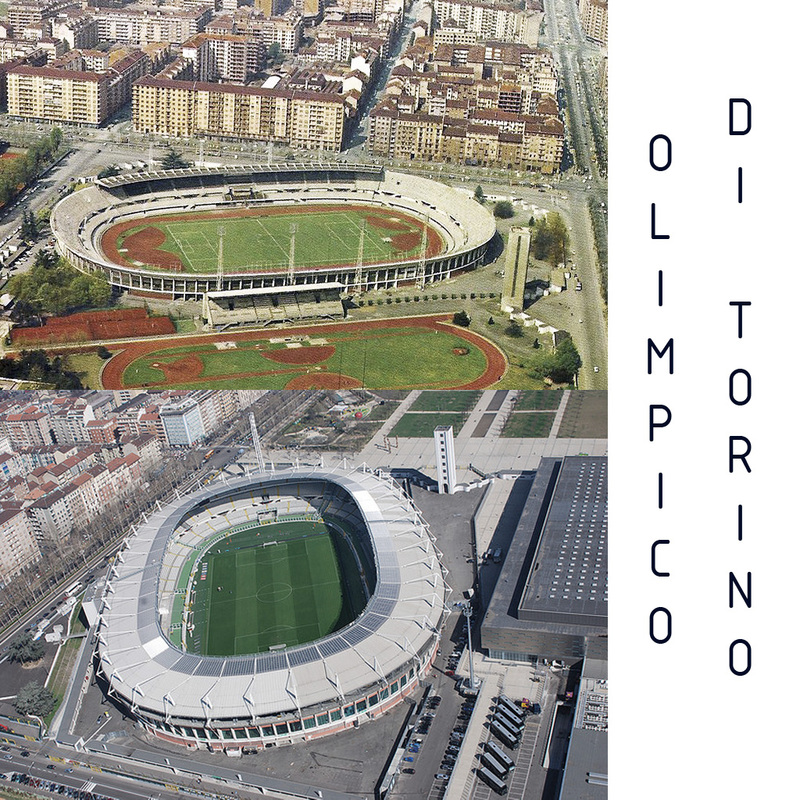 Such structures are Palazzo dello Sport, Stadio Flamini, Palazzetto dello Sport, and the recently demolished Velodromo Olimpico. The Engineer Pier Luigi Nervi, played an important role in many of the structures built for these Olympic Games. Furniture and Craft Fair. The main exhibition hall was designed by Italian architect Massimiliano Fuksas in 2005. However, the story and tradition of Milan’s fairs and exhibition events date back to the World’s Fair of 1906. At that time the Fair was held near the grounds of Sempione Park. In 1923 in the old Alfa Romeo factory, Fiera Milano opened its permanent grounds which hosted the main exhibition events until the new fairgrounds were opened in 2005 in Rho-Pero. With the current economic crisis, there are many uncertainties to what the final product will be. However, the current government of Enrico Letta has committed in making this event a success. Many visitors from all over the world are expected during and prior to the 6 months of the fair. Previously, the Expo 2101 in Shangai had a record number of 73 million visitors with the participation of 250 countries. So far 138 countries have confirmed their participation in the Milan 2015 Expo. With Dubai moving a step closer to hosting the Expo 2020 it reminds us of the relevance and the impact to the city and country’s infrastructure when hosting such events. Dubai’s infrastructure has grown in the past years and it’s already used to hosting and managing world class events. The Arabian sense of hospitality play an important role as it becomes an opportunity for the local government to showcase the Arabian culture in all of these events. The calendar of the Dubai Convention Center reflects the government’s intention to create and develop an economy beyond the oil revenues. The Dubai Convention Center was built in the 1970’s and its architecture reflects the early attempts at finding a modernist approach to Arabian culture. Its location on Sheikh Zayed Road marks the beginning of an impressive display of over 60 skyscrapers, including the Emirates Towers and Burj Khalifa. Qatar which will be hosting the World Cup in 2022 is underway to a highly challenging task. It will be the second time that the World Cup will be hosted in Asia. Previously it was co-hosted by Japan and South Korea in 2002. There is already some controversy in regards to the high temperatures in Qatar during the months of June and July, as the World Cup is traditionally played during these months. UEFA, the European Football Association, has verbally sustained to play the 2022 World Cup during the European winter months. However, this is just the start of an exciting and challenging task that Qatar has ahead. So what are the benefits of hosting such events? It’s a broad question, but we can draw a few conclusions analyzing some of the different events that have left a mark to the city and country’s infrastructure. The Flushing Meadows – Corona Park in the borough of Queens in New York City was built for the 1939-1940 New York World’s Fair. It also held the 1964-1965 World’s Fair. Corona Park is a 3.63 km2 park, the 4th largest park in the city. 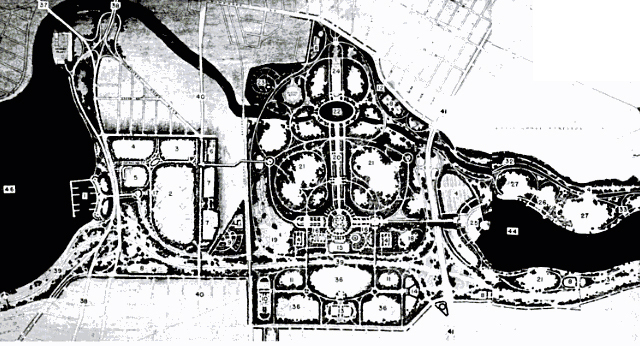 Robert Moses, at the time Parks Commissioner of the City of New York, cleared the grounds from coal-burning ashes in order to build this park for the World’s Fair. 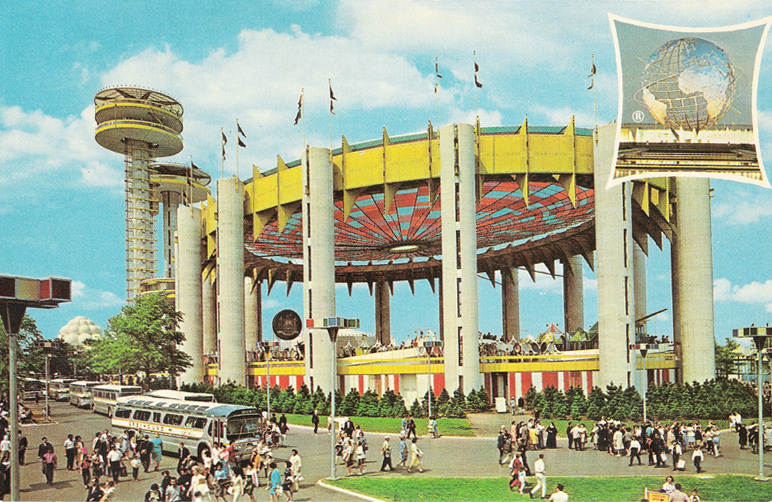 As a result from the fair the park grounds hold the New York State Pavilion futuristic observatory towers designed by the architect Philip Johnson for the 1964-1965 fair. Today, the New York City Pavilion from the 1939-1940 fair, houses the Queens Museum Art. This building from 1946 to 1951 was used as the UN headquarters prior to moving to the Manhattan headquarters designed by Le Corbusier and Oscar Niemayer. Corona Park since 1978 hosts the US Open tennis tournament. The park it’s also the home for the city’s baseball team New York Mets. The first stadium, Shea Stadium, was built in 1964 and opened just a few days before the fair. In 2009, the New York Mets moved to Citi Field which was built adjacent to the now demolished Shea Stadium. The number 7 subway line was built to connect Corona Park to Manhattan. This line was largely built to serve the World Fairs in Queens. As a result of this, the Borough of Queens has developed and grown along and under the elevated subway line. People from more than 100 nationalities have chosen to live in Queens. The neighborhoods along the 7 subway line are a clear example of this ethnically diverse area. Its diversity is expressed on the streets as you can find an array of services; from restaurants to foreign banks to a variety of religious places of worship that serve the various ethnic groups. This particular case of the New York City World’s Fairs of 1939-1940 and 1964-1965 are just one particular case that over the years has evolved into a fascinating case by playing an important role in the urban development of New York City and particularly the borough of Queens. In the next entry we would like to analyze the 1990 World Cup held in Italy together with the Milan Expo to be held in 2015 and its impact in Italian Football and in relationship to the current economic crisis. During our 13 month stay in Dubai we had the opportunity to witness and live in a highly contrasting city. A city usually described as fake or uncharacteristic of its region, has proven us to be a complex and fascinating city. Dubai’s construction boom at the turn of the 21st century came to notice with its opulent and ambitious constructions with a variety of architectural styles. 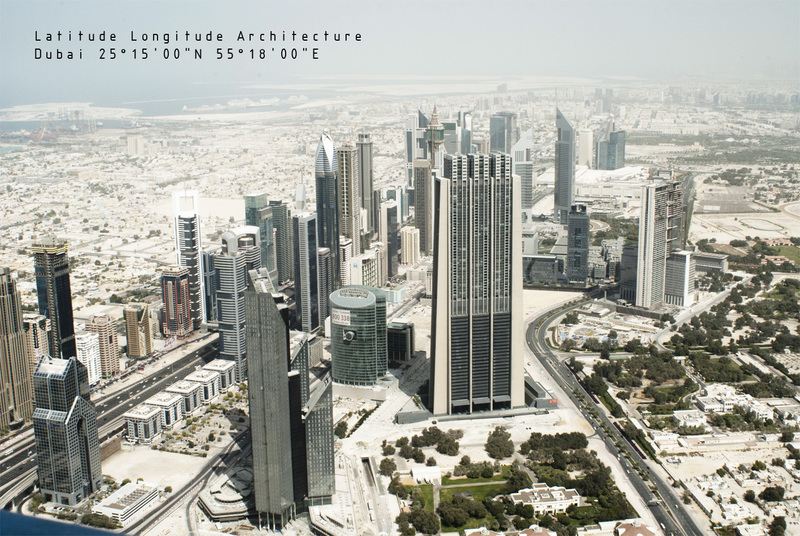 Its tall and impressive skyline is perhaps more successful collectively than each project individually. There is no hierarchy in the design of the buildings or a relation to any sort of context. Burj Khalifa, currently the tallest building in the world, has imposed itself over the rest of the city. Dubai lacks hierarchy not only vertically but even more horizontally. The city has been mostly developed by private companies, and its unplanned growth is reflected in its lack of a coherent urban layout. The famous Palm Jumeirah, a 5.72 sq km development in the sea is an example of an ambitious yet ambiguous project that captivates Dubai’s architectural statement. When the skyscrapers meet the ground and immediately meet the 2 story pre-boom villas is where these fascinating contrasts start to occur. On one side of the street you can find storefronts of ethnic restaurants, next to a high-end retail shop, across from an oversized villa and behind a 60 story building. Accidentally and unplanned is in these spaces where Dubai shows its multicultural character where a variety of occupants interact with each other and where different building scales meet. Dubai and the UAE’s population is largely made up of foreigners. According to The Government of Dubai, the local Emiratis make up only 15% of the Emirate of Dubai’s population. In the construction business, foreigners play a key role both in the managerial positions as well as in the labor workforce. Workers come mostly from the Indian sub-continent and Southeast Asia. These workers are involved in all types of construction projects. Recruiting agencies and labor supply companies are responsible for relocating these workers to the UAE. The impact that the UAE and other gulf states have in the economy of the countries where these workers come form is significant. The remittances sent by these workers are an active source of income for their families and to the economy of the country. Therefore, the construction boom and economy of Dubai goes beyond the boundaries of the UAE. These labor force being mostly made up of a male population has also a direct impact on the demographics of Dubai. According to The Government of Dubai, the total population of Dubai is around 2 million inhabitants, where approximately 1.5 million are male and 500,000 are female. An interactive map of Dubai found at the Government of Dubai website, breaks down the demographical statistics of each neighborhood. In the areas predominantly inhabited by workers, such as Al Quoz, the male population can reach up to 99%. Without getting into the discussion of the working conditions that these workers face, we are interested in exploring and analyzing Dubai in the context of the region and the area that it impacts; to understand what happens in the rest of the world as Dubai gets built. This model is very similar in other gulf countries, such as Saudi Arabia, Qatar and Kuwait, which are also actively building. 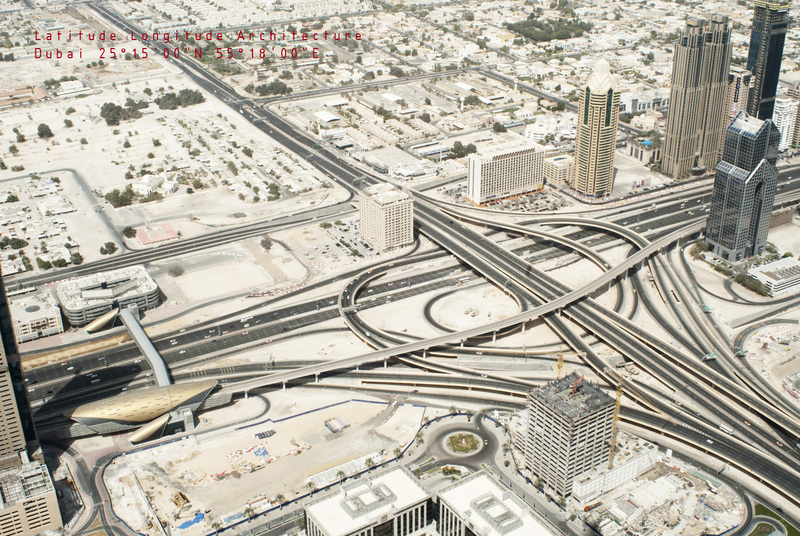 European and American, architecture, engineering, and construction companies are involved in large-scale developments which employ a foreign labor force just as in the UAE. Government projects such as the 3.5 sq km King Abdullah Financial Center in Riyadh, Saudi Arabia is currently employing thousands of workers, heavily relying on a foreign workforce. Contractors are assigned by the government a quantity of visas depending on the scale of the project. These visas are sometimes restricted with a quota or limit of the nationalities that need to be employed. With the state of the economy and construction in Europe and the United States, the Middle East also become influential in the European construction market, as individuals and companies search in this area for projects and opportunities. Dubai, has achieved more than just facades and ambitious projects. It has become an extremely influential city with significant impact in other regions outside the Gulf. Its infrastructure and its Arabian sense for hospitality, has paid-off by making Dubai a destination that yearly hosts events that range from sport events to professional congresses or simply an attractive tourism destination. All these different layers makes Dubai a fascinating and complex city. Architecturally it might look banal and fake but you don’t need to look too deep to discover and experience the richness of its contrasts. It’s been almost 6 months since we received our degree as Architects. There’s been some time for us to reflect on our years in Denmark while we face the demands of our current assignment and job. We are currently living in Dubai, UAE. We are working with a façade engineering company and a curtain wall manufacturer in the construction and design of some of the towers for the King Abdullah Financial District in Riyadh, Saudi Arabia. The masterplan for this project was designed by the Danish firm Henning Larsen Architects. Among HLA’s projects the Copenhagen Opera House has a special relation to us as it was our daily companion while studying in Copenhagen. Our studios faced the back of this iconic building that has controversially become a reference point on the beautiful Copenhagen canal and an axis to the Marble Church and Amelienborg Palace complex. The KAFD project in Riyadh is a highly ambitious project that has included many high profile firms to design buildings for it. For us, it’s a new experience that is enabling us to face and learn at a very technical level with a different perspective on architecture and construction. Living in the Middle East is also exposing us to the rapid growth of Dubai and the other cities in the region which are ambitiously seeking a new form and identity. Dubai is perhaps the most extreme of all these cities. 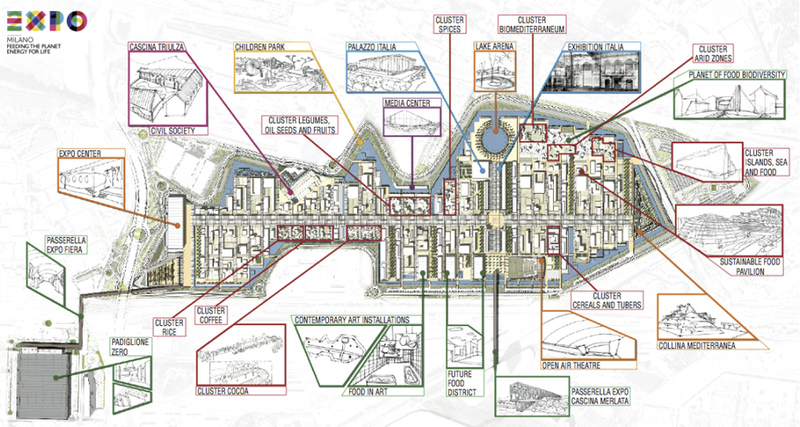 The undated “Dubai Plan” is as eccentric and determined as the projects built over the past 2 decades. There’s already been revisions to its scope but nonetheless its intention has a significant statement worthwhile looking into. The ambition goes beyond building infrastructure and perhaps its most striking feature is to challenge the sandy dunes with a fluvial system fed by the the Gulf’s waters. This would bring into the city a different ecology and potentially even an alternative method of communication and transportation in a car dependant city. The Dubai creek has played an important role to the port settlement origins of Dubai. The most significant construction done in the 1960’s was the removal of banks of sand from the creek to enable larger ships to reach the core of Dubai (Bur Dubai and Deira). This had a significant impact in the shipping industry and helped Dubai grow beyond an informal settlement. Since then, the creek has been expanded and has brought a more dynamic ecology into the city. A bird sanctuary occupies part of this expansion near the Industrial Ras al Khor area. It challenges the city at more than a visual level and has introduce a new set of ecologies which could successfully have an unknown but a hopeful constructive impact. What lesson could this have on the way we plan cities? There is plenty of criticism, which we hardly disagree, on the way that Dubai has boosted its growth and development. However, there are many issues and opportunities worth the time looking into. Perhaps this slower period of economic slump is the right time to catch up with Dubai and digest the past 20 years of metabolized growth in order to face and confront this contradictory city. Our minds naturally compare our years in Denmark to our current location, Dubai, (25°15′00″N 55°18′00″E). Copenhagen is a city that in the other hand it’s been celebrated as a modern sustainable city. As we confront these two cities we aim at extracting a set of case studies and observations that could potentially create an stimulating and provocative dialogue at a ample array of levels.